JRV Home Inspection Services does not perform septic system inspections, but can in many areas provide a septic inspection for our home inspection clients. For those areas we can not serve we strongly encourage hiring a professional, certified septic installer to inspect the system. A word of caution, it is preferable to pump and clean the tank as part of the inspection, which allows for interior inspection of the tank. The pumping and cleaning is customarily paid by the seller with the actual septic inspection paid by the buyer. The following information is provided to educate potential home-buyers about septic systems. On sight sewage disposal systems (septic systems) are a common means of ridding a home of human and household wastes. They are found in almost every city and town across the country, especially in rural areas. 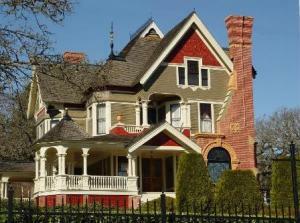 Most homebuyers and homeowners are completely unfamiliar with the workings of these systems. We encourage homebuyers who are considering purchasing a home with an on-site sewage disposal system to read this septic system buyers guide published by the State of Connecticut. An area of controversy and concern with septic systems is the discharge of water softener back flush from homes with water treatment systems into the septic system. The State of Connecticut does not allow this effluent to be sent into the septic system. However there are several studies that have concluded there are no ill effects to a septic system from these water treatment discharges. Further the United States Environmental Protection Agency has issued a fact sheet stating the same. “Get to Know Your Septic Tank” is the title of a popular bulletin of the University of Minnesota Extension Service. Unfortunately, too many homeowners don’t know their septic tank. The tank is buried and forgotten, along with the rest of the system, until sewage is ankle deep in the basement or bubbles up in the yard. Then another septic tank system is unfairly criticized for failing to do its job. How many people would buy an expensive car and never change the oil? How many would never remove the ashes from a wood stove or fireplace? When the car breaks down or the stove is so full of ashes that no more wood can be put in, we don’t blame the car or the stove. But when a sewage system fails for lack of proper maintenance, the blame is often incorrectly placed on that “no-good” septic tank. The septic tank is the essential first part of an onsite sewage treatment system; and it’s both very simple and very complex. Raw sewage flows into the tank from the house sewer. The solids separate from the liquid and stay in the tank. The liquid flowing out is called septic tank effluent. A septic tank is watertight so that when 5 gallons of sewage enter from a toilet flush, 5 gallons of effluent must flow out of the tank. Bacteria that do not use oxygen from the air grow in the tank. These bacteria are called anaerobic and the by-products of their activity are methane and hydrogen sulfide gas, plus other substances having odor. Hence, the word “septic” has been applied to this tank. But the septic tank might also be described as a settling tank where the sewage solids are stored while the bacteria decompose them and reduce their volume. The volume is never reduced to zero, however, so a residue remains. It is this residue that must be cleaned out of the tank when the volume becomes too great. Sewage flows to the septic tank through the house sewer. This pipe must have the proper slope; not too steep so that the liquids run away from the solids and not too flat so that the solids settle out in the sewer pipe. A grade of from one to two inches in eight feet is used. This is a slope of one to two percent. A one- percent slope is a one-foot drop in a hundred feet of pipe. The house sewer should not have any low spots where liquid can remain. In freezing climates these low spots are the places where sewer pipe freezing happens. A sagging sewer pipe and a dripping faucet are usually sure signs of a frozen house sewer in the northern climates. The house sewer pipe should be smooth on the inside so that sewage won’t catch and start a blockage. Toilet paper might hang up on a rough spot at a pipe joint causing a continuing problem of sewer pipe plugging every so often. If the homeowner notices that the toilet isn’t flushing as fast as it used to, or the floor drain is backing up when the clothes washer discharges, the problem may be a partially plugged house sewer pipe. There are also many other causes but this is one place to start looking. The house sewer becomes the inlet pipe to the septic tank. The bottom (invert) of this inlet pipe should be two to three inches higher than the invert of the outlet pipe of the septic tank. As the sewage reaches the tank it drops into the liquid in the tank with a downward flow direction. This drop tends to move the sewage into the depth of the tank. Most states specify an inlet device, either a baffle or a sanitary tee. The purpose of the inlet device is to prevent the floating solids, called the scum layer, from building up and plugging the end of the sewer pipe. Some states don’t require inlet devices and many devices get knocked off if the house sewer is improperly rodded with a plumbing snake to open up a plugged pipe. These tanks seem to operate O.K. and as long as the house sewer pipe doesn’t plug at the tank end; it’s difficult to insist that an inlet device is absolutely essential. The bottom of the inlet baffle or sanitary tee should extend below the surface of the liquid at least six inches and not more that 20 percent of the tank liquid depthÑ see Figure 1. So for a tank that has 60 inches of liquid, the baffle or tee should extend at least 6 inches but not more than 20 percent of 60, or no more than 12 inches below the surface of the liquid. If the baffle or tee is not deep enough, the floating scum layer may tend to plug it. If the baffle or tee extends too deep, the downward flow may cause agitation in the tank and result in more solids carried out with the effluent. 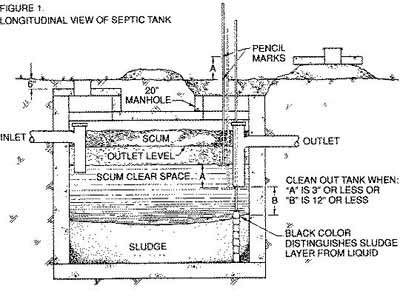 There are three distinct zones or layers in a septic tank as shown in Figure 1. At the top is the floating scum layer which collects wastes such as soap or detergent scum, cooking fats, cigarette filters, and any other material that floats. Most of the material in the scum layer does not decompose under the bacterial action in a septic tank. At the bottom of the tank is the sludge layer that consists of decomposing and partially decomposed solids that sink to the bottom of the tank. The decomposition process continually goes on in the sludge layer. Some solids can’t make up their mind whether they will sink or float and may remain in the clear zone between the scum and sludge layers until such time as they are carried out through the outlet baffle and pipe. These items have the same density as water so will tend to neither sink nor float. Inorganic items such as plastic film, condoms, etc., can cause serious plugging problems in a septic tank and should never be flushed down the toilet. The center zone is called the clear zone, which is liquid that contains suspended solids and bacteria. It is important that the tank have a deep clear zone. As the scum and sludge layers become thicker, the depth of the clear zone decreases. Then the speed at which liquid flows through the tank speeds up and begins to carry some of the solids out of the tank. It is these solids that begin to plug the pores in the soil. The tank needs cleaning whenever the bottom of the scum layer gets too close to the bottom of the outlet device or the top of the sludge layer gets too close. See Figure 1 for these amounts. The sewage flowing into the tank determines the nature of the bacteria in the tank. Some families of bacteria do better with one type of sewage, others do better with different sewage. No two septic tanks operate exactly the same. The nature of the raw sewage is different because of the eating and living habits of the family. The amount of water use is different so that the dilution of sewage is different. Different home cleaning products are used, as are varying amounts of other household chemicals and cleaners. Tank temperatures differ depending on type of water use, depth that the tank is buried, tank insulation, etc. All of these factors affect the bacterial population and the intensity of bacterial action. Bacteria are always present in sewage, however. If there is food and the proper temperature, they will grow and multiply. Septic tank bacterial action starts by itself and continues as long as solids are deposited in the tank. An outlet device, baffle or a tee as shown in Figure 1 definitely is needed on every septic tank. The bottom of this device should extend into the liquid a distance equal to 40 percent of the liquid depth. This is the location determined by a number of tests to provide for the clearest effluent to leave the septic tank. If there is no outlet device or if it falls off or is removed, then the scum layer will flow out of the tank and into the soil treatment unit, plugging the soil pores. This is why it is a good idea to have access to the soil treatment unit at a valve box or the first drop box to inspect the quality of the septic tank effluent. Such inspection could be a service contracted with a local company. Providing regular maintenance to homeowners with a service contract should be an excellent sales opportunity for local service businesses. Septic tank effluent is usually cloudy and contains suspended solids and pathogens (disease-causing bacteria and viruses). No, it is not good enough to drink, regardless of what you may have heard at one time. A half cup of effluent will likely contain a million or more bacteria and as many viruses. Suspended solids have a concentration of 45 to 65 mg/l (milligrams per liter). These are the solids that won’t settle out, and cause the cloudy color. Since only about half of the oxygen-demanding material in the raw sewage has been removed in the septic tank, the effluent must have further bacterial action for treatment. This treatment takes place in the soil treatment system. In northern climates, lower septic tank temperature result in slower bacterial action than further south where the average soil temperature is higher. The use of cold water detergents has decreased septic tank temperatures. A septic tank which is installed relatively shallow will be warmer at least during the summer months. Many installers in Minnesota are insulating the top and sides of the septic tanks with several inches of expanded polystyrene. This increases the tank temperature, which is particularly beneficial in the winter. A septic tank in a northern climate will need to have the solids removed more often than a tank further south. This is primarily because of the cooler temperatures which inhibit bacterial action and provide less decomposition of the sewage solids. Two tanks in series are beneficial. On my home system I have studied the time of flow into and out of the septic tank. A toilet flush that takes about one minute to flow into the tank will take over 15 minutes to flow out in a trickle. So, if there were a second tank, the flow into that tank would be much slower and the outflow even slower. The slower flow would result in better quality effluent because more solids would be settled out and result in longer drainfield life. A number of local ordinances in Minnesota now specify that two septic tanks shall be used. The Minnesota State Standards specify that when a garbage disposal is used there shall be two septic tanks connected in series. Plugging problems have been caused by using cast iron pipe at the outlet of septic tanks. The trickle flow out of the septic tank seems to cause an encrustation or corrosion of that pipe. Plugging may occur in from 5 to 15 years. So many problems were caused by cast iron outlet pipe of septic tanks that the State of Minnesota now forbids the use of cast iron. Plastic pipe with a strength of Schedule 40 or 3034 must be used and adequately supported between the septic tank and the edge of the excavation in order to prevent sagging at this point. If the drainfield is not surfacing and the sewage is backing up in the house, the septic tank outlet pipe may be plugged if it is cast iron. Inspection pipes should be installed over the inlet and outlet devices. Their basic purpose is to provide access for removing obstructions. Also, the amount of sludge in the bottom of the tank can be determined through the inspection pipe located over the outlet device. The amount of scum cannot be measured through the outlet device, however. To determine the amount of scum in a septic tank it is necessary to enter the tank before the outlet inspection pipe. This is why some tanks have a manhole either over the outlet device or near the center of the tank. Water softener discharges are often blamed for the malfunction of the septic tank. In meetings on septic systems about half of the people will have had problems while the other half will have experienced none. A slight saline solution is good for bacterial growth. The agar culture used to grow bacteria in the laboratory is saline. However, too much salt will be detrimental to bacterial growth. A properly functioning water softener will not add much sodium chloride to the recharge wastewater. As the softener gets older and particularly if there is iron in the water, the efficiency may drop unless the resin beads are kept clean. Resin beads that are iron-fouled cannot take on the same amount of salt and the unused salt goes into the wastewater. As the beads become more and more fouled, the frequency between softener recharges is more often in order to get soft water, and more and more of the salt is wasted. This means that more salt gets into the septic tank and may be too strong for the bacteria to grow. Another problem is the extra water that the water softener recharge adds to the septic system. A system that is just big enough to take the daily sewage flows may experience back-ups when a softener is added. This extra water cannot be handled by the system that is now too small. The softener gets blamed for the sewage system failure. Remember that each septic system has a maximum daily capacity. When more liquid flows in than the system can handle, back-ups or surfacing will occur. Septic tanks should be constructed of good quality materials, which are not subject to excessive decomposition or deterioration. The tank material must be strong enough to withstand earth pressures and not collapse when the tank is cleaned and pumped. The septic tank, tank cover, and manhole extensions must be water tight to prevent leakage or infiltration of ground water. Remember that the septic tank is a settling tank, which collects and stores sewage solids. When the storage gets full, the tank must be cleaned and pumped.